It is amazing how things in one’s life can change so much in just several hours. Here I am late yesterday afternoon with Ann and Jerry posing for this photo…..and then a few hours later….I became a MOM! Shortly after this picture was taken, the Moss’ left for dinner. All was quiet in my life and it seemed like we’d all have a relaxing evening. Then suddenly things started to change! A few hours later, Mike Cline called Ann and Jerry to let them know I was feeling a bit restless and I could possibly foal later that evening. Jerry immediately called MY JOHN and Dottie in California… and everyone started to PACE. Shortly after this, my water broke…and my lovely FOAL was bornat 10:10 last evening. As I’ve said so many times before, NATURE IS TRULY AMAZING! HE IS ADORABLE, I AM SO EXCITED…and I AM SO BLESSED! I am one who likes to LICK. It is a habit I developed somewhere along the way in my life. As you may remember, I used to lick MY MARIO’S face all of the time after I won a race. Thus, licking my dear foal seems like second nature to ME. He is one handsome guy and I am now beginning to see that he and I will be embarking on an entire new journey as the future unfolds. Hope you and “Z Baby” have had a wonderful first weekend together! I think the weather has been hospitable in Kentucky — it has been sunny and mild in NC. Look forward to your next post and photos! Love you, sweetie (& little sweetie). Hugs! Just think about where we all were mentally this time last week! Little did we know THEN that we had SO many more days and long NIGHTS ahead of us! Now here it is the start of a brand new week and our beloved Z will start her day tomorrow out in the bright sunshine (well, I HOPE it will be good weather in KY) with this gorgeous little GIFT by her side teaching him all about the world around him. I, like the rest of you, have watched that part of the video with Ann laying down in the stall with Zennie’s son, LOVING him like we will NEVER be privileged again to see another owner doing over and over and over. SHE is a CLASS ACT and the only thing I wish MORE than to meet Zennie and HER PRINCE in person is to somehow have the honor of meeting ANN MOSS. If the rest of the humans involved in the Thoroughbred industry were more like her the effect would be ENORMOUS! Goodnight to you, MY FOREVER QUEEN and thank you again, Dottie, for allowing us to continue to be up close and personal with the most extraordinary equine that Thoroughbred racing has ever experienced!!! I am also so thankful for finding this group of people to have been able to share all of this with! You are all THE BEST! Truer words were never spoken – I concur! Agree with you. The people on this site are so kind, and I have personally learned things I never would have learned about horses, racing and also people’s amazing life stories. Our internet is so slow, I’ve only gotten a few posts read over the past 3 days. Today I started at the bottom and am going ‘up’. It’s much faster this morning, so I’m on my way “up” and hope to find the video of Ann Moss before internet starts slowing down again. You are SO right, Judy. ANN MOSS is a CLASS ACT. I have watched the TVG video so many times and when ANN says “She (meaning Zenyatta) really loves him and he (meaning the little prince) looks at her and says THAT’S MY MOM – COOL!” I just wish I could give Ann a big hug and tell her how COOL she is! Jerry is pretty cool himself! The Moss’s are the epidomy of CLASS and a SHINING EXAMPLE of what horse owners should be. Dottie & John Shirreffs are right up there with them in the “Class and Shining Example” category. Can hardly wait to see more pictures and videos and to find out what perfect name they have chosen for the little guy. When watching the TVG video and the leggy, 130 lb colt walks UNDER Zenyatta I just can’t help but laugh out loud. Feels good since for most of the video I am wiping away tears of joy. Yes, Zenny, after my long nap this morning into afternoon, I can’t sleep now! YAWN!! Ummm … am I all by myself here Zenny? Just you and I and your little guy? Mmm? Well, just for fun girl, I have a name for you for your cutie pie! How about Star Prince? Just a thought, it is not my decision and I know your mom and dad will have the greatest name for him, I’m sure. Oh, with YOUR imput for sure! I must have watched that video …MANY times and then as Ann was hugging the colt..I sneezed and looked at Zenyatta..(this may be posted earlier) BUT the look on Z’s face as Ann is snuggling is one in a million! she looks like she is smiling or laughing! And yes I finally ordered my Plushie…had to wait until the event! Z’s smile is actually called flehman. Vets think it has something to do with odor. But I’ve seen some horses that seem to this just to get a response from people like a habit. I will say that although Z seemed wiped out after delivering her baby she was totally cool with Ann being in the stall. Mares can be awfully protective of their babies. Z just seems to take all the attention in stride. wish I would have stayed an extra week and joined you and Auntie JAG at this event! Sounds like fun! Such a worthy cause! Must have been some of that Zen Magic there that night! With you and JAG there, it must have been more of a hoot! LOL more than one can take! This is old – not sure if anything can still be done or not…. but maybe it is afterall the Queen……. 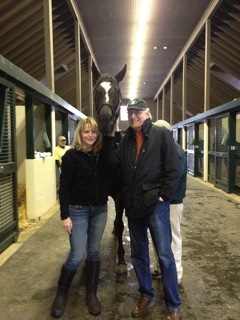 Thank you to Ann and Jerry Moss for allowing us so much access to “The Life Of Zenyatta!!! Thank you Dottie for continuing to write this Diary for Z’s many Hundreds of Thousands of fans WORLDWIDE – Thank you John for allowing me access to see and meet Zenny and spend some time with her… you are AWESOME JOHN!!!!!!! I watched racing before and liked certain horses – and then there was Zenyatta… I had watched her a TVG at Hollywood Park her first couple of races I was cool – watch her go. Then I wanted to see her race live and so I did – she was still very young to racing but very nice to watch…. and as seeing her race almost every time sice then live she grew and changed her style, dance and prance and couldn’t take my eyes off of her. I would go to races and watch a few then spend the rest of my day waiting to get a great shot of her walking into the paddock or saddeling area – I even scrapped my leg at Del Mar trying to get a good shot…. well I have “a Zenyatta scar” for my efforts that I am VERY PROUD off!!! NOBODY has one of those – well maybe. But this one is mine. I have learned so much from having you in my life and THANK YOU TEAM for all that you have given me. Hugs and Love and Dottie – when you go to visit the little guy this week I hope…. Please give him lots of Hugs and Kisses and of Course some to Momma Z and tell her GREAT JOB!!!!!!! Love your Fan stories about ZENNY! So cute about your scar…. well probably wasn’t at the time, but now a wonderful memory. Agree with you about Zenny’s family. The Moss’s, the Shirreffs, everyone at Lane’s End and Barn 55, Mike Smith….everyone has been so thoughtful, generous and kind. PS I just thought of ZENNY in the photo on today’s post. ZENNY, you are too cute! Still know where to look at the camera… head up… ears up… so cute! I’m sure you’re already teaching Your Colt about being a ‘star’! Also one of the best pictures of YOU and Your Jerry and Ann! Congratulations Z! He is beautiful just like his mamma! Good Morning, Zen. Yes, I agree that the name for you has probably already been chosen but I do like “Lunar Landing”. Enjoy your baby and stay happy. “Z” congratulations momma. Jerry and Ann love you soooooo much. We all love you!!!!! Im so happy for you and your baby is just beautiful. I loved seeing your video out in the paddock with your baby. He is gonna be a spunky guy. I love you Z. Cant wait to see the two of you grow up together. Best wishes and alll the success in the world. Cant wait to hear his name. Hope this doesn’t burst anyones imaginationary bubble, but who exacty is the “voice” of Zenyatta on this site? I know many “pretend” on here that they are commuting directly with ZENYATTA, but who are we really getting it from? My guess is someone from the farm, Dottie and the rest of ther team are miles away, so my guess it’s someone from the farm. Also, I guess it’s fun for us to suggest names, but in reality it could be a year or more before the Moss’s choose a name. Baby Foals are rarely named unless the owners are for sure keeping it, i’m sure the Moss’s won’t depart from this one, so a name could be chosen in a few months. Remember they bought Zenaytta at Auction as as yearling and then named her thereafter. When I write Zenyatta, I really am addressing her. It’s what I would say if I were with her. I think you are missing what makes this such a spectacular effort! Z speaks to us through Dottie (yes, in California) who must spend more time than we can imagine getting the needed info (not to mention pictures) from Lane’s End. Does it really matter? “WE talk to Z as if she were here with us–like she is our horse. We would be in the stall talking to her. Don’t you ever talk to your pets? Same thing. As for who listens? I could guess the Moss’s do or their representatives. They have Z’s name and likeness to protect. As well as the baby. I know Dottie checks here or has another employee who checks here. Really what do you care? If we’re happy to address our thoughts, words, and wishes to Z who are you to complain? Is it hurting you? Sure a lot of it is anthropomorphic. But in this case that’s half the fun. Listening to Dottie as though she were transcribing Z’s thoughts is GREAT fun. You miss so much when you don’t allow yourself to see and feel this part of the journey. And it’s been a journey for all. What a road many of us have traveled in the past couple of years! Thank you so much for sharing your wonderful video…..can’t stop watching it! Peace & Happiness to U Both! I continue to look at photos/video of your beautiful son, Zenyatta! Thank you for sharing first person with us! Gorgeous, so glad everyone is doing so well! He is just so handsome, no wonder you can’t stop kissing him! I had an inspiration for HIS name. Each full moon has a name (e.g., full moon in October is the Harvest Moon). Then I saw what the moon in March was called: Worm Moon!!! Yikes!!!! Judy. I see what you mean. Zenyatta, I’m really glad that you enjoyed your big day and I know you’re really excited. I’m really excited as well. All the people following the birth of your foal must be really exciting. Get some rest.